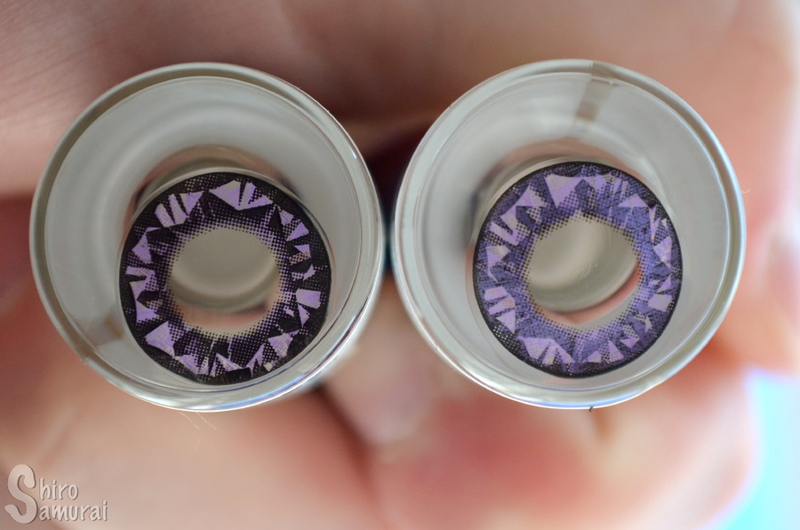 This time it's the GEO Xtra Diamond Violet circle lenses! They can also be identified by their number code: WT-B31. The lens to the right is "wrong" side out. 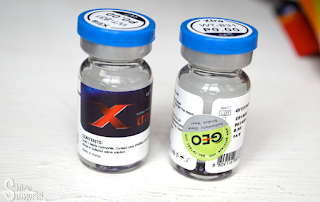 The design is really eye-catching and I'm hoping that it will look just as good on my eyes as it does in the vials! Now to try them on! My first thought when I had finally gotten both lenses in was "these are thiiiiiiiin". I had problems getting them to "set" on my eyes – this could be a mix of base curve difference (my base curve is around 8.6 mm) and the thinness itself, I assume. When I put the lens in and then blinked my eyelid would take the lens up with it and then the lens would kinda just, err, fold itself out of my eye. Hard to explain! 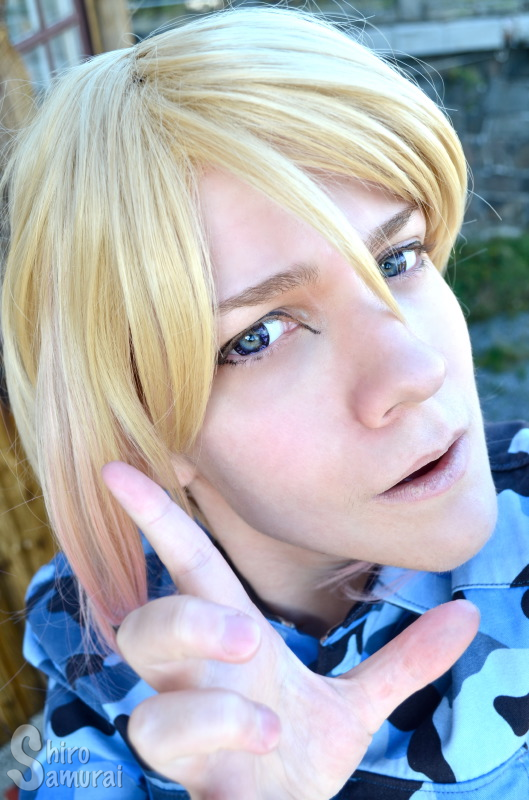 x) I also experienced the lenses literally wrinkling on top of my eye while it was trying to adjust itself in place; I had to force my eyelid not to blink or the lens would have gone off with the upward movement – or wrinkled even more. When I had both lenses on I noticed that my eyes did the whole watery blur thing, aka that my vision blurs while my eyes moisten immediately after putting in contact lenses. This disappeared after a few minutes and the lenses settled properly. The first 30 minutes the lenses were surprisingly comfortable – I barely felt them in my eyes! But that didn't last long, sadly. :c After about 1-1,5 hours I started feeling the lenses in my eyes and especially so when I moved my gaze around. At around the same time the left lens suddenly stung in my eye (which forced me to close my eye tightly in discomfort) and somewhere before or after that my eyes got really watery; I also got especially blurry vision on the left eye too, although both my eyes got the blur effect. Around the 2 hour mark the lenses felt rather dry and already after 2,5 hours I just wanted to take them off. My eyes felt soooo dry after I took the lenses off and the dryness lingered on for pretty long – then again, take this whole comfort thing with a grain of salt since I've had sensitive/dry eyes lately. It's a bother. OTL I was mostly indoors while wearing the lenses and I did look at a computer screen, but the air conditioner was off. I'm surprised that a GEO lens wasn't comfortable for me..? o.o I maybe just had a bad eye day – or this is an unlucky pair? I don't know what but it's a bummer, mreh. All photos taken by me during a September evening with a semi-cloudy sky! In my apartment with only light from the window coming in, aka lamps off. Same as above, aka natural light in the apartment. Light at the bottom of the staircase, aka cellar/basement lamp light. Outdoors with my back against the sun. Outdoors in the building's shadow. These lenses are really big-looking too! The enlargement effect is enough to give dolly eye look, if that's what you're going for! 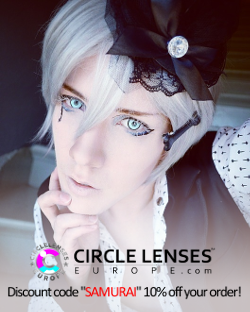 The Xtra Diamond series are definitely circle lenses that make an impact. I believe that these would be great for people who like unique designs that stand out and that you don't bump into everyday! 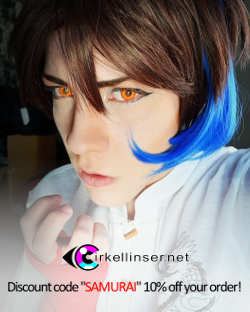 I would assume though that these lenses would look a bit better on dark-eyed people, mainly because at least the violet ones does, err, "clash", a bit with my real eye color because of the big pupil hole – by this I mean that it doesn't give the smoothest transition effect where the lens meets the light-colored iris. It appears a bit harsh and sudden because of the design of the lens, but it's not bad either. 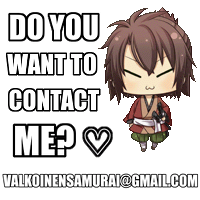 I'm sorry if my explanation makes no sense... ._. The only thing that brings me from really loving this pair is the disappointing comfort in my case; I don't think that I could wear these for much longer than a photoshoot before it would get uncomfortable. 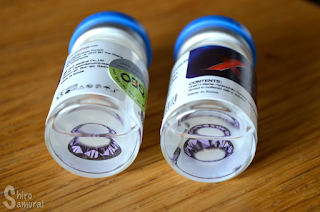 :( I don't feel like I could wear these for a full-day event or anything – not without eyedrops at least. 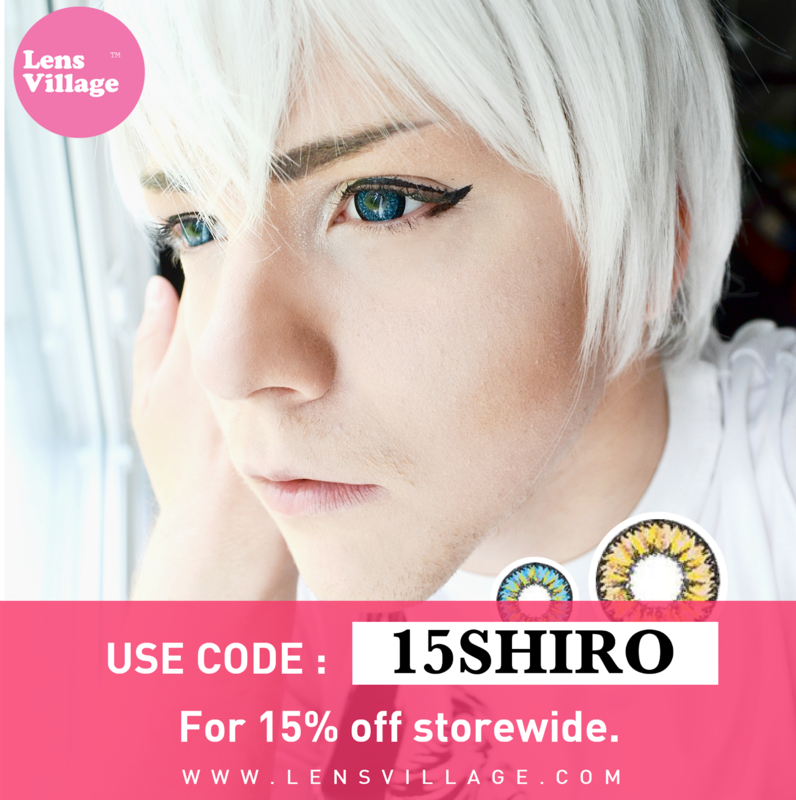 Remember, discount code "SAMURAI15" cuts 15% OFF on your purchase from LensVillage! Nice violet shade that shows up well. The color appears darker from a distance though, because of the lens design. The diamond pattern is eye-catching (especially up close!) with all its details and black inner shades. I would say that the printed part of the lenses is opaque – it doesn't let through my real eye color, save for the pupil hole. These are violet, diamond-patterned and huuuge – totally realistic in other words, right? Riiiiiiiight? I hate when a circle lens is not comfy to me...But the design is cool!